Yummy! This truly decadent waffle is loved by many. 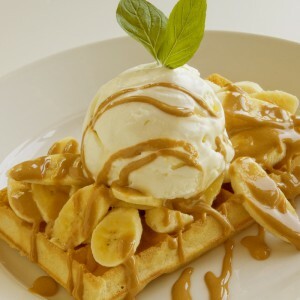 A crisp, perfectly golden Belgian waffle, topped with slices of fresh, locally grown bananas, generously smothered in our delicious homemade caramel sauce. Enjoy this waffle by itself or complement it with a generous serving of dairy cream or ice-cream. As with all our waffles, gluten free, egg free or dairy free options are available on request. Try it once, and you will be back for more!